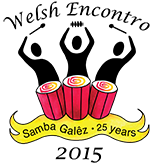 Samba Galez hosted the 2015 Welsh Encontro as part of their 25th anniversary celebrations. As such, we took something of a back seat in terms of performances, but we did save our best to serve as the introduction for our headliners! Check in YouTube if the id PLFhpU2DjnnHZFGV4P7xy-ZjLsiwKcFYLJ belongs to a playlist. Check the FAQ of the plugin or send error messages to support.